Artur SCHNABEL: Klavierquintett (1915-16)1; Drei Klavierstücke, Op. 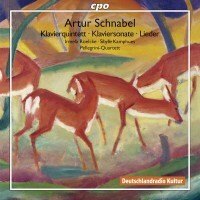 15 (1906)2; Klaviersonate (1923)3; Drei Fantasiestücke (1898)4; Zehn Lieder, Op. 11 (1899-1901)5; Sieben Lieder, Op. 14 (1902-03)6. Irmela Roelcke1,2,3,4,5,6 (pno), Pellegrini-Quartett: Antonio Pellegrini1,4, Thomas Hofer1 (vln), Fabio Marano1,4 (vla), Helmut Menzler1 (vlc); Sibylle Kamphues5,6 (alt). cpo 777 471-2 (2 CDs) (http://www.cpo.de/). Roelcke and the Pellegrinis continue an intrepid exploration of Schnabel’s chamber music (String Quartet No. 1 and Notturno on cpo 777 622-2). This two-CD set’s anchor is the big Piano Quintet, whose music went missing after initial performances. The autograph score was delivered anonymously to the Schnabel archive in 2001 and this is its first recording. At three movements spanning 55 minutes, it’s a monster. Schnabel was clearly finding his way out of expressive tonality. The writhing first movement, Mit größter Energie, could stand some editing. A confused Schubert or a painfully conservative early Schoenberg could have penned some moments. The central Adagio sprawls across 22 minutes. It is difficult to follow Schnabel’s route: There are expressionistic outbursts, feathery impressionistic touches, and finger-wagging dissonance. Piano and strings are not tightly integrated; more often than not they talk past each other. The concluding Rondo turns a corner and presents an integrated composition, lighter in mood with more sophisticated part writing, and closer to Schnabel’s ultimate dissonant stance. Wisely this collection opens with the troublesome Quintet. The remaining pieces written before and after are more polished. The three Op. 15 piano pieces are a Rhapsodie, Nachtbild and a collection of four Waltzes. The Rhapsodie suggests Brahms but with a few quizzical notes; Nachtbild is heavier. The Waltzes contain adventurous harmonies, and are lightly bittersweet, as good waltzes ought to be. Schnabel’s mature Sonata arrived decades later. Roelcke does the heavy lifting in all these pieces, and finds lyric motion within Schnabel’s ardent discords. Like the Quintet, the Sonata’s finale closes with dance motions. The Romantic Fantasiestücke specify an unusual trio: piano, violin and viola. The ten plus seven songs are a reasonable dose of detailed word painting, untroubled and light. Mario PILATI: Piano Quintet in D major (1927-28)1. Achille LONGO: Piano Quintet (1934)2. Circolo Artistico Ensemble1,2: Giuseppe Carotenuto, Nicola Marino (vln), Giuseppe Navelli (vla), Manuela Albano (vlc), Dario Candela1 (pno); Aldo Ciccolini2 (pno). Naxos 8.572628 (1 CD) (http://www.naxos.com/). 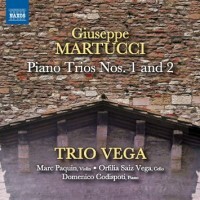 Giuseppe MARTUCCI: Piano Trio No. 1 in C major, Op. 59 (1882); Piano Trio No. 2 in E-flat major, Op. 62 (1883). Trio Vega: Marc Paquin (vln), Orfilia Saiz Vega (vlc), Domenico Codispoti (pno). Naxos 8.573438 (1 CD) (http://www.naxos.com/). As expected, Naxos corners the market on the obscure and forgotten with releases of Italian chamber music. Outside of the Verdi String Quartet and Puccini’s occasional pieces for the same forces, hardly any 19th or 20th-century Italian chamber music has entered the repertoire. Swirling between Franck, Fauré and Puccini, Pilati’s well-built Quintet is an especially fine discovery. Pilati (1903-1938) took a percussive yet passionate path cut short by his early death. We hear modest motor-rhythmic touches, artful instrumentation, and melodies that swoon like popular tunes. 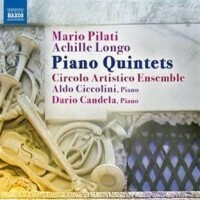 In three movements like Pilati’s, Longo’s slightly later Quintet is denser. Weighty unison passages and thick harmonies suggest German, perhaps even Russian models. The brisk finale’s buoyancy contradicts the first two movements’ tone, thwarting overall unity. Ciccolini studied with Longo (1900-1954). Longo’s father, Alessandro (1864-1945), is the “L” behind one of the first catalogues of Domenico Scarlatti’s sonatas. Like his also forgotten compatriot Giovanni Sgambati, Martucci ignored the late-19th-century Italian obsession with opera and looked towards Germanic concert-hall models. A piano prodigy who matured into a conductor and composer, Martucci’s oeuvre includes two symphonies (1895, 1904) and two piano concertos (1878, 1885) among earlier occasional pieces, but nary an opera. He may be best remembered for La Canzone dei Ricordi (1887), a melancholy seven-part song cycle. Martucci’s Second Piano Concerto was on Mahler’s last concert. The two trios hover in an unexpected place where Classical structure meets lyricism. Programmed in reverse chronological order, No. 2 is quite nearly Brahms, and No. 1 almost Fauré. Trio Vega dispatches these very well. It does seem that Martucci worked valiantly against his times. “American Chamber Music.” Aaron COPLAND: Violin Sonata (1942-43)1. Charles IVES: Largo (1901)2. Leonard BERNSTEIN: Piano Trio (1937)3. Elliott CARTER: Elegy (1943)4. Samuel BARBER: String Quartet, Op. 11 (1936)5. 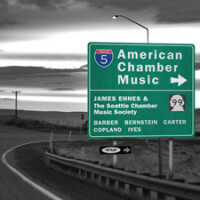 Seattle Chamber Music Society: James Ehnes1,5, Amy Schwartz Moretti2,5, Erin Keefe3 (vln), Richard O’Neill4,5 (vla), Amit Peled3, Robert deMaine5 (vlc), Orion Weiss1, Anna Polonsky2,4, Adam Neiman3 (pno), Ricardo Morales2 (clar). Onyx 4129 (1 CD) (http://www.onyxclassics.com/). Copland’s congenial Sonata sets the tone for a program of early 20th-century chamber music, excellently played. The Ives trio (violin, clarinet and piano) is relatively uncomplicated although gnarled, setting up dissonant ruminations before receding. Also brief, the viola and piano Elegy is one of the few pre-war pieces remaining in Carter’s vast catalogue, lyric and traditionally constructed unlike later challenging works. Bernstein wrote this Trio while a Harvard student. It rambles persuasively through interesting themes and contours. Barber’s Quartet is the big offering, stuck at the end. The slow movement is the original of the excessively familiar Adagio. The challenge for audiences and performers alike is to prevent the experience from devolving into “Three Pieces (One Famous) for String Quartet.” Consequently, this quartet provides the central Adagio with a light touch and invests its emotions in the outer movements, even the all-too-short concluding reprise. 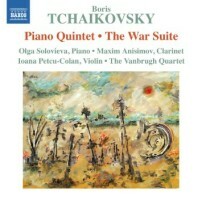 Boris TCHAIKOVSKY: Piano Quintet (1962)1; The War Suite (1964; ver. 2011 by Elena ASTAFIEVA and Stanislav PROKUDIN)2. Olga Solovieva1 (pno), Maxim Anisimov2 (clar), The Vanbrugh Quartet: Gregory Ellis1,2, Keith Pascoe2, Ioana Petcu-Colan1 (vln), Simon Aspell1,2 (vla), Christopher Marwood1,2 (vlc). Naxos 8.573207 (1 CD) (http://www.naxos.com/). 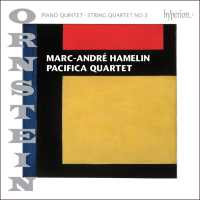 The Quintet neatly interchanges three ensembles: piano alone, string quartet alone and piano quintet. Shostakovich is an influence, but Tchaikovsky is coarser, and whether you explicitly realize how infrequently piano and quartet combine to create the traditional melody plus accompaniment, the work proceeds with steely willpower. The film music only recently rediscovered draws from an ensemble of clarinet and string quartet. Compared to the disjunctive Quintet, The War Suite is tuneful with a catchy recurring waltz, although its subject, WWII during the winter of 1942, reflects bitter endurance. Air raid sirens are cleverly depicted with glissandos. Leo ORNSTEIN: Piano Quintet, Op. 92 (1927)*; String Quartet No. 2, Op. 99 (1929). Marc-André Hamelin* (pno), Pacifica Quartet: Simin Ganatra, Sibbi Bernhardsson (vln), Masumi per Rostad (vla), Brandon Vamos (vlc). Hyperion CDA68084 (1 CD) (http://www.hyperion-records.co.uk/). Coincidence programmed this alongside Satie. Ornstein is obviously more aggressive – barbaro is a frequent designation – but like Satie, larger forms are achieved through presenting more material, simplistically developed. Frequent meter changes and restless, emphatic energy keep Ornstein’s music afloat. Both Quintet and Quartet are three movements: fast-slow-fast. The Quartet was one of Ornstein’s last pieces before a vast quiet period that ended in the 1970s. The Pacificas play with assured mellowness. I expected more menace and aggression, as the motor rhythms, repeated notes, and ostinatos supporting angular motives lend themselves to ugliness. Melodies suggest the modal and exotic with augmented seconds and fourths. Ornstein is like Debussy’s aggressive Eastern-European cousin. Hamelin handles his part effortlessly. There is much to do, however it’s mostly corners and sharp edges, blocky themes, and cavernous arpeggios. Ornstein resists pure lyricism: When pouring out a romantic line – usually declaimed in thick octaves – the accompaniment will arpeggiate like a rocking boat. Enrique GRANADOS: Piano Quintet in G minor, Op. 49 (1894). 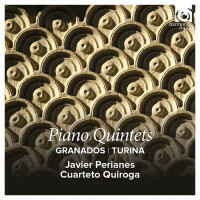 Joaquín TURINA: Piano Quintet in G minor, Op. 1 (1907); Caliope from Las musas de Andalucía, Op. 93, No. 9 (1942). Javier Perianes (pno), Cuarteto Quiroga: Aitor Hevia, Cibrán Sierra (vln), Josep Puchades (vla), Helena Poggio (vlc). Harmonia Mundi HMC 902226 (1 CD) (http://www.harmoniamundi.com/). Although it’s chronologically earlier than Turina’s Quintet, Granados’ three-movement work for the same forces is the more modern effort. It would be possible to confuse Granados’ tidy, 16-minute Quintet for miniatures by Dvořák, just as much as Turina’s ponderous Op. 1 is soaked through with Franck. Turina’s opening slow fugue imparts a solemnity that the faster, more tuneful subsequent movements, especially the second Animé, completely belie. Turina thought enough of this work to designate it officially his first. Written decades later, the nine parts of Turina’s Las musas de Andalucía take their instrumentation from an inventory of soprano, piano and string quartet. Caliope, the ninth muse, is a hymn for piano quintet dedicated to Joaquín Rodrigo. I wish these pieces were a bit more substantial, the apparently truncated Granados especially. No faults with Perianes or the quartet as these are finely done, delicate and precise.